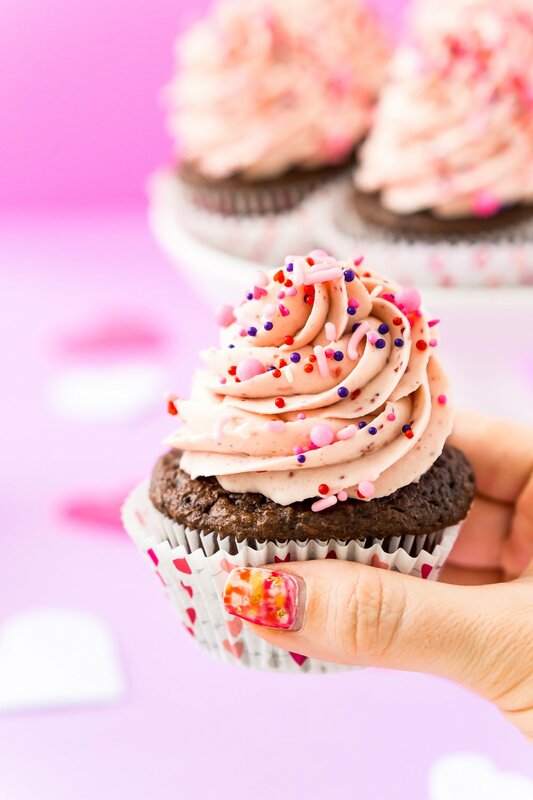 These Strawberry Chocolate Cupcakes are a delicious blend of rich chocolate cake and sweet strawberry whipped cream frosting! Perfect for Valentine’s Day, Baby Showers, Bridal Showers, and more! 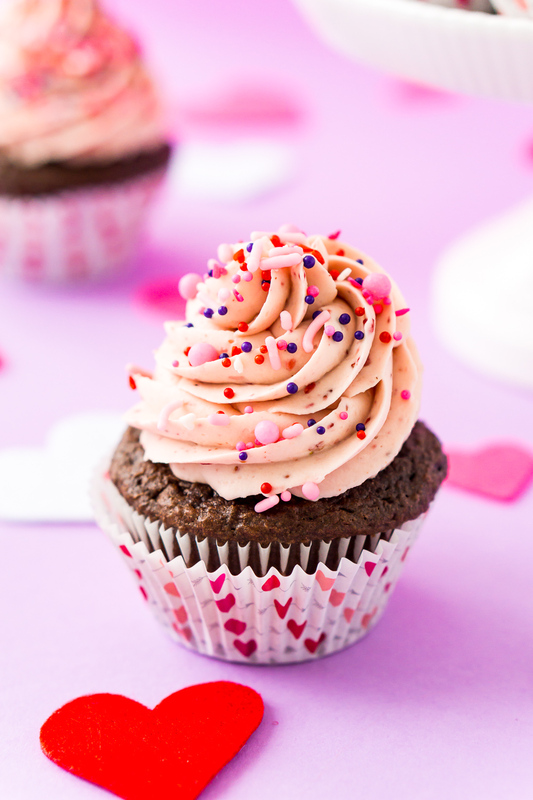 Valentine’s Day is just a few days away and if any of you are looking for a scrumptious last-minute treat, these Strawberry Chocolate Cupcakes are it! 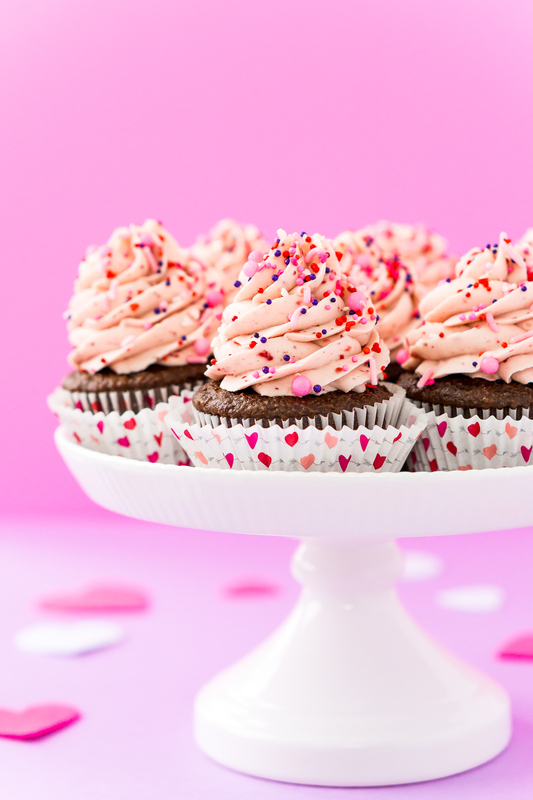 A tender and delicious chocolate cupcake topped with a whipped strawberry frosting made with heavy cream, powdered sugar, pudding mix, and freeze-dried strawberries! I love making frosting with freeze-dried berries, it’s such a wonderful way to add delicious fruit flavors without worrying about the added moisture of fresh fruit. You might remember me using freeze-dried raspberries in these Raspberry Chocolate Cupcakes or freeze-dried mangoes in these Island Daiquiri Cupcakes! The other thing I really love about this frosting is that you can change the flavor of pudding you use depending on what you like. Vanilla, cheesecake, and white chocolate are all wonderful options! Just make sure it’s INSTANT and not cook and serve! If you can’t find freeze-dried strawberries anywhere and don’t have time to order them, you could make this recipe with my easy Strawberry Frosting Recipe. 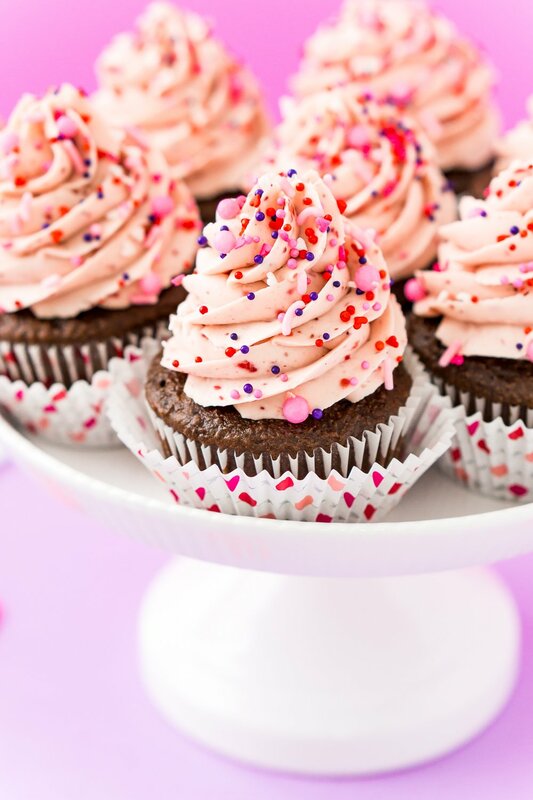 Another fun idea for these Strawberry Chocolate Cupcakes if you’re using them for a holiday would be to use a cupcake corer. Simply core out the centers and filling them with sprinkles or m&m’s – YUM! OR make them extra decadent and fill the centers with chocolate pudding – Extra YUM! More Delicious Strawberry and Chocolate Recipes! Preheat oven to 375 degrees F and line a cupcake pan with liners and set aside. 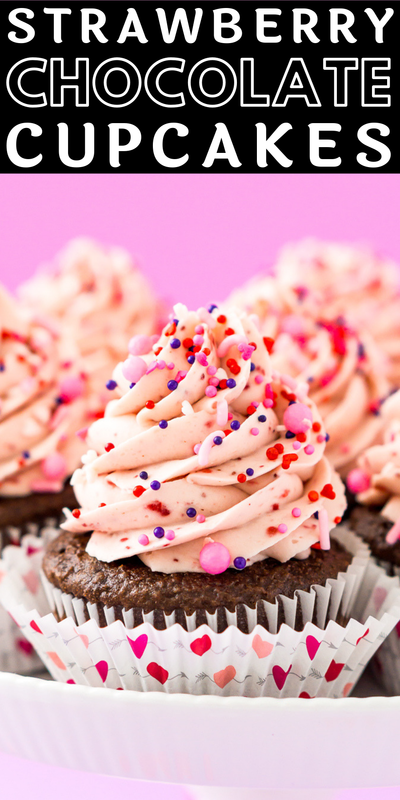 Combine all of the cupcake ingredients in a stand mixer and beat until combined. 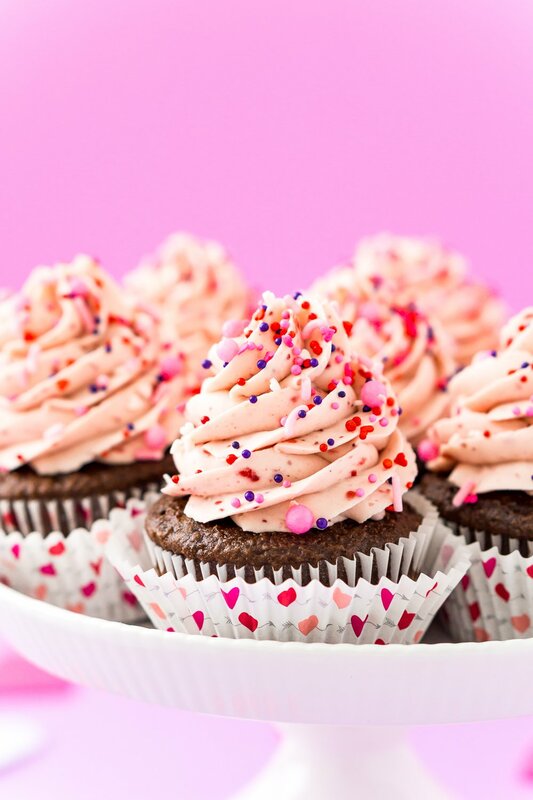 Fill cupcake liners ½ - ¾ full, just slightly less than 1/4 cup of batter in each liner. Reduce heat to 350 degrees F and bake for 18-22 minutes until toothpick comes clean from center. Remove from oven and move cupcakes to cooling racks to finish cooling before frosting. Begin preparing the frosting by adding the freeze-dried strawberries to a food processor and pulse until a fine dust forms. In a large bowl or stand mixer fitted with a whisk attachment, beat the heavy cream, powdered sugar, and pudding mix on medium-high for about 2 minutes. Add in the freeze-dried strawberry powder and beat until light and fluffy. 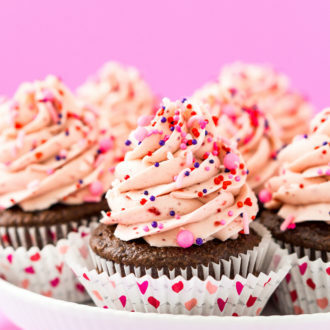 Pipe the strawberry frosting onto chocolate cupcakes and garnish with sprinkles or fresh strawberries, if desired. Instant white chocolate or cheesecake pudding can be used instead of vanilla for a different flavor. The Target variety of freeze-dried strawberries comes in a 1-ounce bag instead of a 1.2, this is plenty, no need to purchase a second bag.